This branch of Eye Surgery deals with problems with the eyelids, tear drainage system and the orbit (the socket that contains the eye). These procedures can either be cosmetic or reconstructive / functional. 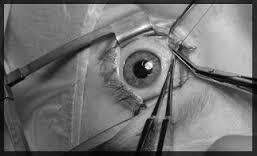 Reconstructive / functional procedures improve the function of the structures around the eye. People with functional lid problems experience difficulties with their vision or field of vision, excessive tearing or pain and discomfort. Eyelid procedures are generally performed under local anaesthetic (with sedation if requested) and orbit and tear drainage surgery is usually performed under general anaesthetic. A droopy upper lid causing poor vision and loss of upper visual field can be repaired by lifting the upper lid (ptosis repair), most commonly by shortening the muscle in the upper lid (which has stretched with age) and reattaching it to the firm structure in the eyelid. This results in loss of upper visual field. A blepharoplasty describes the operation that removes the excess skin in the upper lid. If there is documented loss of visual field, this procedure is usually funded by medical aids as it is not a cosmetic operation. A droopy lower eyelid that falls away from the eyeball. This condition results in inflammation, eye discomfort and tearing. An ectropian repair is performed in order to shorten and / or elevate the lower lid to repair this. Is turning inwards of the eyelid margin towards the eyeball. This results in the eyelashes rubbing against the eye and irritating it. An entropian repair describes the operation that tightens and strengthens the lid such that it sits in its normal position. May be due to poor tear drainage. The drainage can be improved by performing a dacrycystorhinostomy (DCR) or an eyelid procedure. If there is a true blockage of the passage that takes the tears down to the nose, a DCR (dacryocystorhinostomy) is performed which involves making a direct connection between the tear sac and the nose. If there is no absolute blockage of the passage, one can still improve drainage of tears with a DCR. Alternatively, if the eyelids are lax, tightening the lids may help improve the drainage of tears. This may require lid surgery or decompression surgery. There are several procedures that can improve the function of the eyelids, the comfort of the eye, appearance, and in fact vision, in patients with Thyroid Eye Disease.